In a region that is much appreciated for the charm and authentic character of its gently undulating hills, the Luxembourg vineyards belong to one of the most northerly and oldest wine growing regions of Europe. Situated on the slopes running down to the Moselle river which acts as a natural border between Luxembourg and Germany, the vineyards lie in a gentle micro-climate influenced by the river and an ideal south-westerly orientation. The 1235 hectares (3052 acres) of vines are divided into two areas: the canton of Remich with deep and rich soils and that of Grevenmacher, on slowly eroding clay soils. The former produces generous and fleshy wines; the latter is distinguished by the mineral character and finesse of its wines. Since the end of the eighties, Pinot Noir and Chardonnay have completed the list. 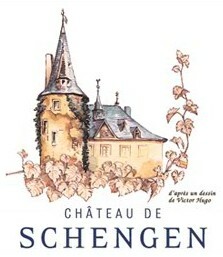 minimum standard for "Chateau de Schengen” wines is "Grand 1er Cru”. within the country and outside its borders. Domaine to extend its range and to become equally renowned for its production of sparkling wines.